Two of TC Boyle’s long running themes collide in his latest novel The Terranauts. On the one hand is his continuing exploration of the power of visionaries to create a following (read cult) and bring people along with their vision (The Road to Wellville is a good early example of this). And on the other, the environment, its fragility, and man’s continuing struggle to both live in harmony with it and destroy it (When the Killing’s Done is a good recent example of this). And like many of his previous books, The Terranauts is built around a true story, because sometimes you just can’t make this stuff up. It is the mid 1990s and eight intrepid explorers, the Terranauts of the title, have been chosen from a group of 16, to spend two years inside a completely sealed habitat known as Ecosphere 2 (the “2” because the Earth itself is Ecosphere 1). Just a note that in the real world, the original was called Biosphere 2 and is still going strong reinvented as a research facility. Ecosphere 2, built in the middle of Arizona, has been established with different biomes – a rainforest, a desert, a small ocean – and is designed to be completely self-sufficient. Once it is closed, nothing is allowed in or out. The idea of the Ecosphere (and the actual experiments like this in the 90s) is to explore humanity’s relationship with nature and how life might be supported on other planets. The Ecosphere project is the brainchild of an eccentric billionaire, known by the crew as GC or God the Creator, far from the only biblical reference or allusion in the novel. The narrative focusses on three characters. Dawn and Ramsay have both been selected for the Terranaut crew while Linda, Dawn’s best friend, missed the cut. None are particularly likeable characters but Ramsay, and Linda to an extent, are self-aware enough to almost admit it in their narration. They are the type of characters that Boyle excels at drawing – complex, flawed and believable, and often their own worst enemies. But it makes for tough reading. For while they are interesting to a point it becomes wearing spending alot of time with them and time is what the Terranauts have plenty of. In the end The Terranauts comes off as a series of cautionary tales. It seems that the type of people best suited for a long term mission of a small group (say to Mars) are exactly not the type of people you should send. And it should come as no surprise, even without this, that putting yourself at the whims of a billionaire trying to prove a point and incorporating a reality tv element where the world is watching through the glass can send you all types of crazy. So that it turns out that Linda, who acts like the child left behind in the Pied Piper, turns out to be the luckiest (non-) Terranaut of all (but of course can not appreciate it because she has drunk the Kool-Aid). 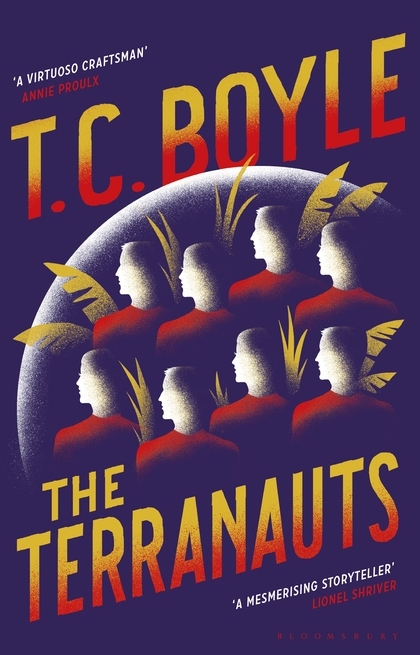 While The Terranauts is in some ways vintage Boyle and a culmination of some of his long running themes it does not work as well as some of his earlier novels. The relationship focus of the eight terranauts, honed by borderline starvation and loneliness, becomes a kind of bizarre soap opera. And if the length and detail are actually a mechanism to give a reader feel of being trapped for two years in a bubble that you can’t escape with people you don’t like – then it works.